The players obviously had other views on the kit colour scheme as early in the season United made a decision to swap the shorts between home and away kits. The tangerine shorts that were originally planned for the away kit, were used with the home kit. The black shorts from the home outfit were then used with the away kit. Both strips actually looked much better for the change. Keith also praised the sponsors for their willingness to change the colour of their logos to match the United kit, ‘’To have both Calor and Dents8 agree to adjust their logo to implement our club colours also shows the strong relationship we have with our kit sponsors.’’ The launch of the away kit also coincided with a brand new one year shorts sponsorship with Dundee based cosmetic car repair specialists Dents8. The shirt was black with white sleeves and black cuffs. The Nike swoosh was embroidered in white. The away kit had white player names and numbers and the Clydesdale Bank logo on each sleeve. United first wore the away kit at Pittodrie on the 15th October 2011 in a 3-1 defeat to Aberdeen. 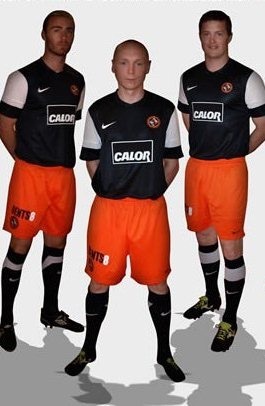 They would go on to wear the away kit at Motherwell also in the 11/12 season. United last played in the kit at Motherwell on the 13th of May 2012, where both Daly and Russell scored.